Inspirational and awesome!! Love it. I Am That I Am The Artist Known As “The Tree of Life’ Matron Saint Josesphine Beatrice – Jesus Christ – I Am Anointed With My Sacramental Holy Hemp, the Blessed and Sweet Maryjane, So As To Be Closer To The Holy of Holies. I have Roger to thank for inspiring me to express the truth about the hemp and the goddess through my art. He gave me the book by Chris Bennet – Green Gold The Tree of Life Marijuana in Magic and Religion, which shows hemp used and enjoyed world wide, since the beginning of time. Roger’s poem is wonderful and sad, he said alot and it should be printed and distributed. The pot war is a war against Mother Nature and planet Earth. It is an alien based invasion – read Roger’s favorite book – Slave Species. I posted what Roger wrote to me on my website. That was awesome Roger it is good to see you are in high spirits despite your awful situation. I wish there was more that I could/can/would have done to help you, the others and the cause. I hope you know that there are a lot of us praying for your safety and return to the free world. One love from Idaho. I visualize this song being blasted over mile high speakers at a solar hempowered nationwide rock concert, California Republic to Washington, DC…electric guitars blowin em right out of their seats. Imprisoned-without-trial-or-bail for almost a year (July 8th) Reverend Roger Christie, THC MInistry founder and Cannabis scholar, has had this study posted on his website for years. 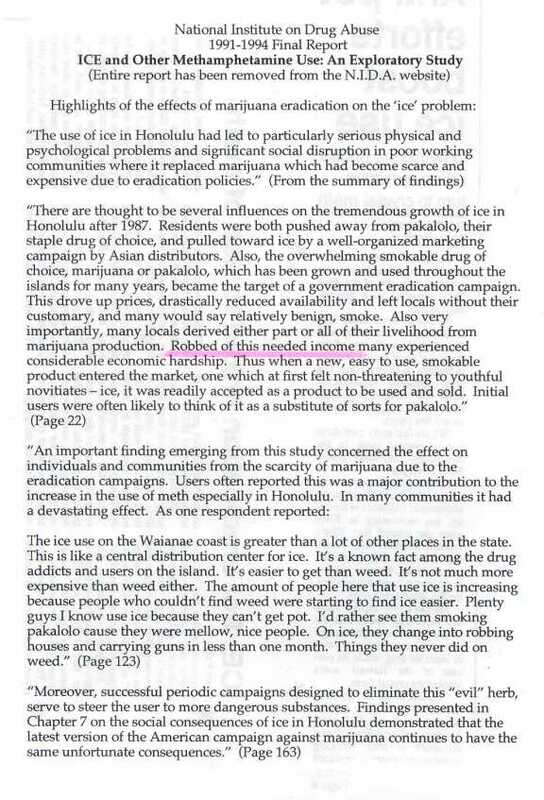 It’s ludicrous that that NONE of the “drug policy reform establishment” references NIDA’s own report on the consequences of marijuana eradication in arguing against marijuana prohibition. May Haoma bless us with long life and fruitfull living. May Haoma bless you, Roger and friends, with Victory. May Haoma’s powerful instrument, the mace (also a spice, not just a hammer) bring protection to you as you use your tongue to Praise Haoma and help to restore Haoma and the entire family of followers of Haoma to Rightful Religious placings. May you be as successful as Zoroaster in gaining religious protection(for ALL) from the ‘government’. Listening to yourself is no crime, when your self is guided by Good. Are you a threat to the public? Or are you just a threat to deeply ingrained religious ignorance or prejudice? I’m (spiritually/religiously) concerned for the MANY who are righteous followers of Haoma Cannabis, both the incarcerated and the ones living in fear. May Haoma bring new beginnings for peace. May THE WISE LORD of CREATION, who blessed the Herb and the herbs for earthly use, also bless us all.